Metastatic neck disease is the most important factor in the spread of head and neck squamous cell carcinoma from primary sites. The primary sites most commonly involved in the spread of this carcinoma are the mucosal areas of the upper aerodigestive tract, particularly the larynx, oropharynx, hypopharynx, and oral cavity. Lymph node metastasis reduces the survival rate of patients with squamous cell carcinoma by half. The survival rate is less than 5% in patients who previously underwent surgery and have a recurrent metastasis in the neck. Therefore, the control of the neck is one of the most important aspects in the successful management of these particular tumors. Radical neck dissection is an operation that was created in 1906 to solve the problem of metastatic neck disease. It is a well-designed operation that is relatively easy for the trained head and neck surgeon to learn and to perform. Classic radical neck dissection is still the criterion standard for surgical control of a neck metastasis. Patient in supine position and head turned to the right side. 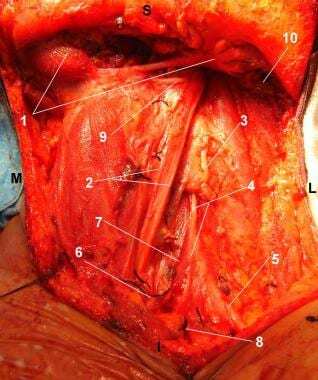 Radical Left Neck Dissection completed: The classical radical neck dissection encompasses the lymphatic nodes in levels I-V. View of the surgical wound after removal of the operative monoblock specimen. S = Superior. I = Inferior. M = Medial. L = Lateral. (1) Anterior and posterior bellies of the digastric muscle. (2) Carotid artery and vagus nerve. (3) Anterior cervical nerve root. (4) Phrenic nerve. (5) Brachial plexus. (6) Internal jugular vein, inferior aspect, cut and ligated. (7) Anterior scalene muscle. (8) External jugular vein, inferior aspect, cut and ligated. (9) Hypoglossal nerve. (10) Sternocleidomastoid muscle, superior aspect, cut. In the last 3 decades, progressive advances have occurred in the understanding of cervical fascial planes, lymphatic drainage patterns, preoperative staging, and extracapsular spread. A concern to maximize control and to minimize morbidity has prompted modifications to the classic neck dissection. One such modification is the preservation of 1 or more nonlymphatic structures (eg, spinal accessory nerve, internal jugular vein, sternocleidomastoid muscle). Further observations have indicated that the pattern of nodal disease depends on the primary site. Therefore, these findings led to another neck dissection modification, which is the selective preservation of 1 or several lymph node groups. In 1906, George W. Crile was the first person to describe radical neck dissection, which encompasses the surgical removal of neck metastasis contained between the superficial and deep fascial layers of the neck. Hayes Martin routinely used radical neck dissection for the management of neck metastasis in the 1950s. The main goal of this procedure was to remove, en bloc, the entire ipsilateral lymphatic structures from the mandible superiorly to the clavicle inferiorly and from the infrahyoid muscles to the anterior border of the trapezius. The resection included the spinal accessory nerve, the internal jugular vein, the sternocleidomastoid muscle, and the submandibular gland. The anatomic structures that remained were the carotid arteries, vagus nerve, hypoglossal nerve, brachial plexus, and phrenic nerve. This operation and its oncologic concept are still valid; however, the procedure has been modified to decrease its morbidity but to maintain its oncologic efficacy. In the 1960s, O. Suarez and E. Bocca independently described a more conservative operation that involved removing all the lymph nodes but sparing the spinal accessory nerve, sternocleidomastoid muscle, and internal jugular vein. Finally, further procedures were designed to remove only selected regional lymph groups involved, depending on the primary site of origin. Multiple modifications to the radical neck operation brought about new terms to describe such changes, and the terms for the same modification varied from author to author. Many cases of unclear terminology created confusion among clinicians from different geographical areas and institutions. Therefore, standardization was necessary. In 1991, the American Academy of Otolaryngology-Head and Neck Surgery published an official report that standardized the terminology for the different types of neck dissection. Type I: The spinal accessory nerve is preserved. Type II: The spinal accessory nerve and the internal jugular vein are preserved. Type III: The spinal accessory nerve, the internal jugular vein, and the sternocleidomastoid muscle are preserved. Extended radical neck dissection: The lymph node groups and/or additional structures not included in the classic neck dissection are resected. The 2011 publication by Ferlito  states the rationale for a new neck dissection classification/nomenclature and uses the symbol “ND” for neck dissection. The levels and sublevels of nodes removed are identified by Roman numerals (I through VI) and the nonlymphatic structures removed are identified by abbreviations (SCM, IJC, CNXI, etc.). The purpose of this new classification is the unification of terminology used in neck dissection around the world. Lymphatic metastasis is the most important mechanism of spread in head and neck squamous cell carcinoma. The risk of lymph node involvement by metastasis varies depending on the site of origin, size of primary tumor, histologic grade of the primary tumor, perineural invasion, perivascular invasion, and extracapsular spread. Management of the neck lymph nodes is an integral part of treatment of head and neck cancer. Conversely, no single standardized treatment for cervical metastasis exists. The indications and type of neck dissection to be performed in the N+ neck and management of the N0 neck remain controversial. Management is based on personal experience and retrospective studies. Radical neck dissection was the first attempt at adequately treating metastatic cervical lymphatic spread. The classic operation was subsequently modified several times to decrease morbidity without decreasing oncologic control. The 2 procedures in common use today are the modified radical and the selective neck dissections. The incidence of metastatic disease for the upper aerodigestive tract varies widely, from 1-85%, depending on the site, size, and differentiation of the tumor. The rate of ipsilateral metastatic disease in patients with stage T3-T4 squamous cell carcinoma of the oral cavity, oropharynx, hypopharynx, or supraglottis is approximately 50%. The rate of bilateral or contralateral metastatic disease in these patients varies from 2-35%. Nasopharyngeal carcinoma appears as a neck mass in approximately 50% of patients. Metastatic neck disease in thyroid gland tumors occurs as follows: papillary, 55%; medullary, 50%; and follicular, 25%. Anterior portions of the oral cavity are associated with smaller risk of neck metastasis than posterior portions. Young patients with oral carcinoma have a higher risk of developing nodal metastasis than older patients. Risk of neck involvement by metastasis increases with an increase in tumor size. Perineural and perivascular invasion are associated with a high risk of nodal metastasis. The extracapsular spread of the nodes also carries a high probability for lymphatic spread. Poorly differentiated tumors are associated with a higher risk of neck metastasis than well-differentiated tumors. Radical neck dissection is performed for the surgical control of metastatic neck disease in patients with squamous cell carcinomas of the upper aerodigestive tract, salivary gland tumors, and skin cancer of the head and neck (including melanomas). Radical neck dissection is also indicated for the surgical control of metastatic carcinoma to the neck when the nasopharynx and thyroid are the primary sites. Metastasis occurs frequently in malignancies. The tumor grows at the primary site by dysfunction in cellular proliferation, differentiation, and death. Mutations due to chemical carcinogens, radiation, or viruses may cause activation of oncogenes by normal cells, multiple genetic mutations, activation of proto-oncogenes, and/or inactivation of tumor suppressor genes, which may cause alterations in growth control. Tumor cells move through the basement lamina of the epithelium and the stroma into the lymphatic and vascular channels (ie, the tumor progresses from carcinoma in situ to microinvasive tumor). This process is related to the production of cytokines, enzymes, and growth factors that destroy the basement membrane and create abnormal angiogenesis, which, in turn, triggers neovascularization and growth. The tumor spreads into the regional lymph nodes by lymphatic and vascular channel invasion and may seed other parenchymal sites if tumor invasion is not controlled at the lymphatic level. The usual sites of secondary spread include the lungs, liver, bone, brain, and adjacent skin, as well as other sites, depending on the tumor histology. Most patients present with a unilateral or bilateral neck mass. Usually, the patient is already aware of the primary lesion, or it is found during physical examination of the upper aerodigestive tract. In 15% of patients, a metastatic neck mass is present without an obvious primary lesion. In this situation, making every effort to identify the primary lesion is difficult. These patients require a careful evaluation of all mucous membranes of the upper aerodigestive tract with blind biopsies and an ipsilateral tonsillectomy. The accuracy of nodal status relates to the physician's ability to detect cervical adenopathy. Palpation is the technique used most in the detection of neck metastasis. Although palpation is inexpensive and easy to perform, it is not totally reliable. Sensitivity and specificity of the neck examination by palpation range from 60-70%. A short obese neck and/or previous radiation or surgery makes the physical examination more difficult. Therefore, negative palpation findings of the neck still indicate a risk for occult metastatic disease. This risk increases according to the site, size, and particular characteristics of the primary lesion. Imaging is an integral part of clinical diagnosis and staging, and the results are helpful in deciding treatment. Among these techniques are computed tomography (CT) scanning, magnetic resonance imaging (MRI), ultrasonography, and ultrasound-guided aspiration cytology. CT reveals metastatic adenopathy by central necrosis and extracapsular spread by enhancement of the nodal capsule. MRI is less precise than CT scan in identifying tumor necrosis and extracapsular spread, but MRI is better in assessing enlarged lymph nodes that do not necessarily represent metastasis. Both techniques cannot detect lymph nodes smaller than 1 cm. which, on occasion, independently of the size, are involved in metastasis. Ultrasound-guided aspiration cytology has a higher specificity than CT and MRI in analyzing lymph nodes, particularly in smaller nodes of less than 10 mm. However, the yield of this technique is directly related to the experience of the ultrasonographer and the pathologist. Recent literature has demonstrated the higher sensitivity and specificity of the FDG-PET compared with ultrasonography, CT scan, and MRI in the assessment of metastatic staging of neck carcinomas. This finding could signify a positive role for PET in the identification of metastatic disease in patients with a clinically N0 neck. PET findings could provide early diagnosis of recurrent head and neck cancer, as well as indicate the status of the neck after chemoradiotherapy. New challenges have occurred in the last 15 years in the selection of candidates for neck dissection who were treated initially with organ preservation treatment protocols and who may have persistence of neck disease after the nonoperative management. This group of patients can benefit greatly from the routine use of posttreatment PET/CT during their assessment for subsequent surgical management of the neck. PET and PET/CT are discussed further in the Workup section. Finally, the criterion standard for the detection of lymph node metastasis in the neck is the careful histologic examination of all nodes by the pathologist after the neck dissection is completed. Detection and accurate staging of neck metastasis are extremely important because staging has major implications for prognosis and treatment. Therefore, when oncologic principles are not compromised (ie, no gross evidence of extension to the spinal accessory nerve or the internal jugular vein), modified radical neck dissection is preferred. Furthermore, in selected patients with clinical neck metastasis, a selective neck dissection has been advocated in clinical trials. Therefore, in the case of positive neck metastasis, the option of Modified RND or Selective ND will remain a surgeon's judgment call, taking into consideration the intraoperative findings and the level of oncological experience. As a consequence, the indications for Modified RND and Selective Neck Disection are not well defined or standardized, and vary from surgeon to surgeon. A word of caution, never sacrifice surgical oncological principles for a less radical surgery. Multiple positive neck nodes clinically present in an untreated patient (N2b, N2c), in particular in the proximity of the accessory nerve and posterior neck triangle. One or more positive neck nodes clinically present with extracapsular extension involving the spinal accessory nerve and internal jugular vein. Imaging studies and/or clinical evidence of extranodal disease. Neck metastasis with involvement of the platysma muscle and cervical skin. Recurrent or persistent metastatic disease is present after previous conservative neck dissection, irradiation, chemoradiation, or a combination thereof. Radical neck dissection is effective in controlling a postirradiation cervical metastasis from a nasopharyngeal carcinoma if the primary site is under control. Modified radical neck dissection type III is also indicated for patients with a palpable metastasis caused by a differentiated carcinoma of the thyroid. According to some authors, modified radical neck dissection type III is indicated in patients with squamous cell carcinoma and an N0 neck when the original tumor is in the larynx, hypopharynx, or both. Other authors prefer further modification by sparing the submandibular triangle nodes because of low risk of metastasis to those nodes. A comprehension of the relevant neck anatomy is mandatory to understand how to perform an adequate radical neck dissection. From the surgical point of view, each side of the neck is divided into 2 cervical triangles. The neck is divided into an anterior and a posterior cervical triangle. The borders of the anterior cervical triangle are the inferior border of the mandible, the sternocleidomastoid muscle, and the midline of the neck. The anterior cervical triangle is further subdivided into 4 smaller triangles: the submandibular triangle, submental triangle, muscular triangle, and carotid triangle. Understanding and identifying each of these areas guide the surgeon in performing a complete removal of the entire contents of the anterior cervical triangle. The inferior border of the mandible and the 2 bellies of the digastric muscle delineate the submandibular triangle. The mylohyoid and hyoglossus muscles form the floor. Contents are the submandibular gland, lymphatic structures, anterior facial vein, and facial artery. The lingual nerve is above the muscular floor and below the deep layer of the deep cervical fascia. The anterior belly of the digastric muscle, the hyoid bone, and the midline of the neck delineate the submental triangle. The mylohyoid muscle forms the floor of the submental triangle. It contains a few lymph nodes and small tributaries of the anterior jugular vein. The omohyoid muscle in the anterior cervical triangle delineates the muscular triangle below and the carotid triangle above. The posterior cervical triangle is also referred to as the lateral cervical triangle and is limited by the anterior margin of the trapezius muscle, the posterior border of the sternocleidomastoid muscle, and the middle third of the clavicle. The posterior aspect of the omohyoid muscle further subdivides the posterior cervical triangle into 2 smaller triangles, the occipital triangle, which is located above the omohyoid muscle, and the supraclavicular triangle, which is located inferiorly to the muscle. The cervical lymph nodes are divided into superficial and deep chains. Superficial lymph nodes are involved in a late stage of cancer; therefore, they have less oncologic importance. Deep cervical lymph nodes receive drainage from areas of the oral cavity, pharynx, larynx, salivary glands, thyroid, and the skin of the head and neck. These deep cervical (superior, middle, inferior) lymph nodes accompany the internal jugular vein and its branches. Oncologically, the superior jugular nodes (ie, the group that is near the anterosuperior aspect of the accessory nerve) are crucial. They represent the most difficult area in the resection of the deep jugular nodes. Cervical lymph nodes localized in the posterior triangle of the neck are classified into the upper, middle, and inferior cervical nodes. Posterior triangle nodes are located beneath the upper portion of the sternocleidomastoid muscle and extend posteriorly along the course of the spinal accessory nerve. This group of lymphatics receives drainage from the nasopharynx and communicates directly with the upper deep nodes from the internal jugular vein. The posterior triangle nodes in the inferior aspect progress anteriorly to the supraclavicular area to join the internal jugular vein at the base of the neck. The above groups are easier to understand if they are divided into levels or zones as recommended in the Neck Dissection classification update revision proposed by the American Head and Neck Society and the American Academy of Otolaryngology Head and Neck Surgery.(2002). Vb - Transverse cervical and supraclavicular nodes. Platysma muscle: The rectangular and sheetlike platysma muscle extends obliquely from the upper chest to the lower face, from posteroinferior to anterosuperior. Its undersurface creates an ideal plane in which to elevate the skin flaps in a neck dissection. The platysma muscle is absent in the lower anterior midline of the neck and in the area posterior to the external jugular vein and greater auricular nerve. Sternocleidomastoid muscle: The sternocleidomastoid muscle runs from its anteroinferior attachment to the sternum and medial clavicle, posterosuperiorly to the mastoid tip and surrounding skin. The greater auricular nerve and the external jugular vein cross the upper aspect of this muscle. These structures guide the surgeon to the right plane of dissection and should be left on the surface of the sternocleidomastoid during flap elevation. The fascial envelope of the muscle is a key structure for selective neck dissections. The spinal accessory nerve crosses over the internal jugular vein in approximately 70% of individuals. The nerve then passes medially to the posterior belly of the digastric and stylohyoid muscles. Anatomic variations include the spinal accessory nerve that runs medially to the internal jugular vein (approximately 30% of individuals) and that runs through the vein (approximately 3% of individuals). The nerve then enters obliquely into the sternocleidomastoid muscle from superior to inferior with the exit at Erb point. The Erb point is near the greater auricular nerve at the posteroinferior edge of the sternocleidomastoid muscle. Digastric muscle: The posterior belly of the digastric is an important landmark. This belly extends from the hyoid bone to the undersurface of the mastoid tip. Important and delicate structures are recognized medial to the muscle. Therefore, it is superficial to the external and internal carotid artery, the hypoglossal nerve, and the internal jugular vein. Lateral to the posterior belly of the digastric, the only structure to be preserved is the marginal mandibular nerve. The marginal mandibular nerve is localized deep to the superficial layer of the deep cervical fascia, which covers the submandibular gland and is superficial to the anterior facial vein. The best way to preserve the nerve is to identify it carefully at the above locations. Once the nerve is identified, the tissue lateral and inferior to the nerve can be divided for exposure of the posterior belly of the digastric. Trapezius muscle: The trapezius muscle extends from the posterior occiput to the lateral third of the clavicle. The anterior border of the trapezius is the posterior edge of level V, or the posterior triangle, of the neck. Like the digastric muscle, the omohyoid muscle has 2 bellies. The anterior belly is superficial to the internal jugular vein. The posterior belly is superficial to the brachial plexus, phrenic nerve, and transverse cervical artery and vein. Like the digastric muscle, the omohyoid is a key anatomic landmark in radical neck dissection. The vagus nerve in the neck is intimately associated with the carotid sheath and is immediately deep to the internal jugular vein. The vagus nerve may be injured during the dissection and division of the lower portion of the internal jugular vein. Identification of the vagus nerve before division of the internal jugular is mandatory. The hypoglossal nerve in the neck travels under the internal jugular vein, passes over the internal and external carotid arteries, and continues inferior to the posterior belly of the digastric muscle to enter the tongue musculature. Identifying this nerve is important to avoid injury. The phrenic nerve lies above the anterior scalene muscle and deep to the transverse cervical artery. The brachial plexus exits lower in the neck and then passes between the anterior and middle scalene muscles. Identify the anterior and middle scalene muscles before clamping the lymphatic structures. Avoid dissection in the supraclavicular area before phrenic and brachial plexus visualization. Thoracic duct: The thoracic duct, located in the lower left neck, arises posterior to the internal jugular vein and anterior to the phrenic and transverse cervical artery. The anatomy is variable, and the duct has multiple interdigitated channels. Since the development of newer surgical procedures minimizing surgical morbidity, the contraindications to a neck dissection have been controversial. However, patients who have too great a surgical risk because of cardiopulmonary disease and whose condition cannot be optimized preoperatively should not be considered for this operation. Patients in whom preoperative imaging suggests deep infiltration of the tumor in the prevertebral space, scalene muscles, levator scapula muscle, phrenic nerve, and brachial plexus should not be considered suitable candidates. Despite a poor prognosis due to the advanced disease, the resulting morbidity, if not possible mortality, poses no advantage to the patient. The treatment of patients undergoing carotid vessel management remains controversial. From a radiologic standpoint, carotid artery encasement is defined as disease having surrounded the common carotid or internal carotid artery over more than 270° of encirclement. Many have advocated the preoperative evaluation of these patients with a balloon occlusion test. Patients who can tolerate the occlusion of the ipsilateral carotid artery without any evidence of neurologic dysfunction may be candidates in whom the carotid segment may be safely resected. The help of a vascular surgeon or a neurosurgeon in these cases may be advisable for reconstruction of the resected segment. Because patients with significant carotid artery involvement often have preexisting atherosclerotic vascular disease, resection of the carotid artery results in significant morbidity, if not mortality, for most of these individuals. Extensive metastatic involvement of the platysma and cervical skin is not uncommon and is not a contraindication for a radical neck dissection. However, it requires a wide resection of the area affected with local and regional flap reconstruction of the sacrificed tissue. Deschler DG, Moore M.G., Smith RV, editors. Quick Reference Guide to TNM Staging of Head and Neck Cancer and Neck Dissection Classification. 4th ed. Alexandria, VA: American Academy of Otolaryngology-Head and Neck Surgery Foundation and the American Head and Neck Society.”; 2014. [Full Text]. Ferlito A., Robbins KT, Shah JP, Medina JE, Silver CE et al. Proposal for a rational classification of neck dissection. Head Neck. March 2011. 33(3):445-450. [Medline]. Edge SB, Byrd DR, Compton CC , Fritz AG, Greene F, Trotti A., editors. AJCC cancer staging manual. 7th. New York: Springer; 2010. Radiographic examination of the head and neck in head and neck cancer. Petruzzelli GJ. Practical Head and Neck Oncology. 1st ed. Plural Publishing, Inc.; 2009. 25-40/chapter 3. Hamoir M, Silver CE, Schmitz S, Takes RP, Rinaldo A, Rodrigo JP, et al. Radical neck dissection: Is it still indicated?. Eur Arch Otorhinolaryngol. 2013, Jan. 270 (1):1-4. [Medline]. Pinsolle J, Pinsolle V, Majoufre C, Duroux S, Demeaux H, Siberchicot F. Prognostic value of histologic findings in neck dissections for squamous cell carcinoma. Arch Otolaryngol Head Neck Surg. 1997 Feb. 123(2):145-148. [Medline]. McCammon SD, Shah JP. Radical neck dissection. Oper Tech Oto. Sept 2004. 15(3):152-9. Shaha AR. Radical neck dissection. Oper Tech Gen Surg. June 2004. 6(2):72-82. Lucioni M. Practical Guide to Neck Dissection. Second Edition. Springer-Verlag; 2013. [Full Text]. Civantos FJ, Moffat FL, Goodwin WJ. Lymphatic mapping and sentinel lymphadenectomy for 106 head and neck lesions: contrasts between oral cavity and cutaneous malignancy. Laryngoscope. 2006 Mar. 112(3 Pt 2 Suppl 109):1-15. [Medline]. Pitman KT, Ferlito A, Devaney KO, Shaha AR, Rinaldo A. Sentinel lymph node biopsy in head and neck cancer. Oral Oncol. 2003 Jun. 39(4):343-9. [Medline]. Sebbesen L, Bilde A, Therkildsen M, Mortensen J, Specht L, von Buchwald C. 3 years follow-up of sentinel node negative patients with early oral cavity squamous cell carcinoma. Head Neck. 2013 Jun 26. [Medline]. Seethala RR. Current state of neck dissection in the United States. Head Neck Pathol. 2009 Sep. 3(3):238-45. [Medline]. [Full Text]. Patel V, Hood BL, Molinolo AA, et al. Proteomic analysis of laser-captured paraffin-embedded tissues: a molecular portrait of head and neck cancer progression. Clin Cancer Res. 2008 Feb 15. 14(4):1002-14. [Medline]. Shores CG, Yin X, Funkhouser W, Yarbrough W. Clinical evaluation of a new molecular method for detection of micrometastases in head and neck squamous cell carcinoma. Arch Otolaryngol Head Neck Surg. 2004 Aug. 130(8):937-42. [Medline]. Bochen F, Adisurya H, Wemmert S, Lerner C, Greiner M, Zimmermann R, et al. Effect of 3q oncogenes SEC62 and SOX2 on lymphatic metastasis and clinical outcome of head and neck squamous cell carcinomas. Oncotarget. 2017 Jan 17. 8 (3):4922-4934. [Medline]. Strati A, Koutsodontis G, Papaxoinis G, Angelidis I, Zavridou M, Economopoulou P, et al. Prognostic significance of PD-L1 expression on circulating tumor cells in patients with head and neck squamous cell carcinoma. Ann Oncol. 2017 Aug 1. 28 (8):1923-1933. [Medline]. Karatas OF, Oner M, Abay A, Diyapoglu A. MicroRNAs in human tongue squamous cell carcinoma: From pathogenesis to therapeutic implications. Oral Oncol. 2017 Apr. 67:124-130. [Medline]. Agcaoglu O, Aliyev S, Mitchell J, Milas M, Siperstein A, Berber E. The use of the harmonic scalpel versus knot tying for modified radical neck dissection. Surg Innov. 2013 Feb. 20(1):81-5. [Medline]. Park YM, Holsinger FC, Kim WS, et al. Robot-assisted selective neck dissection of levels II to V via a modified facelift or retroauricular approach. Otolaryngol Head Neck Surg. 2013 May. 148(5):778-85. [Medline]. Byeon HK, Holsinger FC, Koh YW, et al. Endoscopic supraomohyoid neck dissection via a retroauricular or modified facelift approach: Preliminary results. Head Neck. 2013 Jun 1. [Medline]. Melvin TA, Eliades SJ, Ha PK, et al. Neck dissection through a facelift incision. Laryngoscope. 2012 Dec. 122(12):2700-6. [Medline]. [Full Text]. Tae K, Ji YB, Song CM, Jeong JH, Cho SH, Lee SH. Robotic selective neck dissection by a postauricular facelift approach: comparison with conventional neck dissection. Otolaryngol Head Neck Surg. 2014 Mar. 150 (3):394-400. [Medline]. Porceddu SV, Jarmolowski E, Hicks RJ, et al. Utility of positron emission tomography for the detection of disease in residual neck nodes after (chemo)radiotherapy in head and neck cancer. Head Neck. 2005 Mar. 27(3):175-81. [Medline]. Schechter NR, Gillenwater AM, Byers RM, et al. Can positron emission tomography improve the quality of care for head-and-neck cancer patients?. Int J Radiat Oncol Biol Phys. 2001 Sep 1. 51(1):4-9. [Medline]. Adams S, Baum RP, Stuckensen T, Bitter K, Hor G. Prospective comparison of 18F-FDG PET with conventional imaging modalities (CT, MRI, US) in lymph node staging of head and neck cancer. Eur J Nucl Med. 1998 Sep. 25(9):1255-60. [Medline]. Andrus JG, Dolan RW, Anderson TD. Transnasal esophagoscopy: a high-yield diagnostic tool. Laryngoscope. 2005 Jun. 115(6):993-6. [Medline]. Argiris A, Eng C. Epidemiology, staging, and screening of head and neck cancer. Cancer Treat Res. 2003. 114:15-60. [Medline]. Aygun N, Oliverio PJ, Zinreich SJ. Overview of diagnostic imaging of the head and neck. Cummings Otolaryngology Head and Neck Surgery. 4th ed. Elsevier Mosby; 2005. Vol 1.: 25-92. Bier-Laning CM. Surgical complications of the neck. Cummings Otolaryngology Head and Neck Surgery. 4th ed. Elsevier Mosby; 2005. Vol 3: 2646-2657. Charron M, Beyer T, Bohnen NN, et al. Image analysis in patients with cancer studied with a combined PET and CT scanner. Clin Nucl Med. 2000 Nov. 25(11):905-10. [Medline]. Cooper JS, Pajak TF, Forastiere A, et al. Precisely defining high-risk operable head and neck tumors based on RTOG #85-03 and #88-24: targets for postoperative radiochemotherapy?. Head Neck. 1998 Oct. 20(7):588-94. [Medline]. Crile G. Excision of Cancer of the Head and Neck. JAMA. 1906. 47:1780-1786. Dedo HH. Surgery of the Larynx and Trachea. BC Decker; 1990. 373-424. Farber LA, Benard F, Machtay M, et al. Detection of recurrent head and neck squamous cell carcinomas after radiation therapy with 2-18F-fluoro-2-deoxy-D-glucose positron emission tomography. Laryngoscope. 1999 Jun. 109(6):970-5. [Medline]. Gavilan Alonso C, Blanco Galdin A, Suarez Nieto C. [Cervical lymph node functional-radical dissection. Surgical anatomy. Technic and results]. Acta Otorinolaryngol Iber Am. 1972. 23(5):703-817. [Medline]. Gil-Carcedo LM, Roman L. Vaciamiento ganglionar cervical radical. Vaciamientos modificados, Capítulo XXV, El Abordaje en el Tratamiento Quirúrgico de los tumores cabeza y cuello. In: Gil-Carcedo LM, ed. Ponencia Oficial de la Sociedad Espanola de Otorrinolaringología. 1992. 373-388. Hanasono MM, Kunda LD, Segall GM, Ku GH, Terris DJ. Uses and limitations of FDG positron emission tomography in patients with head and neck cancer. Laryngoscope. 1999 Jun. 109(6):880-5. [Medline]. Johnson J. Cervical metastases. Gluckman, Gullane, Johnson, eds. Practical Approach to Head and Neck Tumors. Raven Book; 1994. Lonneux M, Lawson G, Ide C, Bausart R, Remacle M, Pauwels S. Positron emission tomography with fluorodeoxyglucose for suspected head and neck tumor recurrence in the symptomatic patient. Laryngoscope. 2000 Sep. 110(9):1493-7. [Medline]. Lore JM, Jr. An Atlas of Head and Neck Surgery. WB Saunders Company; 1988. 650-669. Lowe VJ, Boyd JH, Dunphy FR, et al. Surveillance for recurrent head and neck cancer using positron emission tomography. J Clin Oncol. 2000 Feb. 18(3):651-8. [Medline]. Lowe VJ, Stack Jr. BC, Watson Jr. RE. (Ensley JF, Gutkind JS., Jacobs J Lippman SM, editors). Head and Neck Cancer Imaging, chapter 3. Head and Neck Cancer, Emerging Perspectives: Academic Press; 2003. 23-33. Martin H. Surgery of Head and Neck Tumors. Hoeber-Harper; 1957. 119-130. McPartlin DW, Nouraei SA, Tatla T, Howard DJ, Sandhu GS. How we do it: transnasal fibreoptic oesophagoscopy. Clin Otolaryngol. 2005 Dec. 30(6):547-50. [Medline]. Medina JE. Chapter 113: Neck Dissection. Bailey BJ and Johnson JT. Head & Neck Surgery-Otolaryngology. 4th ed. Lippincoott Williams & Wilkins; 2006. 2: 1585-1609. Medina JE, Lore Jr, JM. (Lore & Medina, editors). The Neck, chapter 16 in An Atlas of Head and Neck Surgery,. Fourth Edition. Elsevier Saunders; 2005. 780-817. Medina JE, Weisman RA. Management of the neck in head and neck cancer, part I. Otolaryngol Clin North Am. August 1998. 585-686. Medina JE, Weisman RA. Management of the neck in head and neck cancer, part II. Otolaryngol Clin North Am. October 1998. 759-856. Montgomery WW, Varvares MA. (Montgomery W.W., editor). Surgery of the Neck, chapter 2 in Surgery of the Larynx, Trachea, Esophagus and Neck,. Saunders; 2002. 43-114. Myers EN. Operative Otolaryngology Head and Neck Surgery, Chapter 78, Neck Dissection. 2nd Edition. Elsevier; 2008. Vol 1: 679-708. Myers LL, Wax MK, Nabi H, Simpson GT, Lamonica D. Positron emission tomography in the evaluation of the N0 neck. Laryngoscope. 1998 Feb. 108(2):232-6. [Medline]. The complete head and neck examination. Petruzzelli GJ. Practical Head and Neck Oncology. Plural Publishing, Inc; 1-15. Robbins KT. Neck Dissection, chapter 116 in Cummings Otolaryngology Head and Neck Surgery, Fourth Edition. Fourth Edition. 2005. Volume Three: 2614-2645. Robbins KT. Pocket Guide to Neck Dissection and Classification and TNM Staging of Head and Neck Cancer. American Academy of Otolaryngology-Head and Neck Surgery Foundation, Inc. 2001. 8-38. Robbins KT. Pocket Guide to Neck Dissection Classification and TNM Staging of Head and Neck Cancer. American Academy of Otolaryngology-Head and Neck Surgery Foundation; 1991. 7-29. Salami A, Bavazzano M, Mora R, Dellepiane M. Harmonic scalpel in pharyngolaryngectomy with radical neck dissection. J Otolaryngol Head Neck Surg. 2008 Oct. 37(5):633-7. [Medline]. Shockley WW, Pillsbury III HC. The Neck: Diagnosis and Surgery. Mosby; 1994. 573-588. Stokkel MP, Terhaard CH, Hordijk GJ, van Rijk PP. The detection of local recurrent head and neck cancer with fluorine-18 fluorodeoxyglucose dual-head positron emission tomography. Eur J Nucl Med. 1999 Jul. 26(7):767-73. [Medline]. Suarez O. El problema de las metástasis linfáticas y alejadas del cáncer de laringe e hipofaringe. Rev Otorrinolaringol. 1963. 23:83-99. The skin incision is made through the platysma, and the flap is elevated in the subplatysmal plane. In the superior lateral aspect of the flap, leaving the greater auricular nerve and the external jugular vein on the sternocleidomastoid muscle is important. The posterior flap is elevated toward the trapezius muscle. The sternocleidomastoid muscle is exposed and incised above the clavicle with Bovie electrocautery. The anterior and posterior belly of the omohyoid is identified. Note that the omohyoid crosses the internal jugular vein laterally. The internal jugular vein is identified in the lower aspect of the neck, and a 2-0 silk suture is then passed around the vein and tied. 2-0 silk sutures and suture ligatures are placed as shown. The supraclavicular fatty tissue is opened using blunt dissection with identification of the phrenic nerve. The phrenic nerve appears as a white cord down the midline of the anterior scalenus muscle. The internal jugular vein has been ligated and transected. The carotid artery is seen on the top of the image. The transverse cervical artery is seen at the bottom of the image. The submental fatty tissue, the submandibular nodes, and the submandibular gland have been removed and displaced inferiorly together with the specimen. The internal jugular vein is identified superiorly, medial to the posterior belly of the digastric muscle. The ligation of the internal jugular vein at this point is performed with a 2-0 silk suture and a distal suture ligature. Final aspect of the surgical wound after removal of the operative specimen. Axial contrast-enhanced neck CT showing an extensive mass of the left side of the neck. Selective Radical Neck Dissection 2-5 Part 1. Video courtesy of Dr. Nader Sadeghi. Selective Radical Neck Dissection 2-5 Part 2. Video courtesy of Dr. Nader Sadeghi. Selective Radical Neck Dissection 2-5 Part 3. Video courtesy of Dr. Nader Sadeghi. Selective Radical Neck Dissection 2-5 Part 4. Video courtesy of Dr. Nader Sadeghi. Selective Radical Neck Dissection 2-5 Part 5. Video courtesy of Dr. Nader Sadeghi. The authors and editors of Medscape Drugs & Diseases wish to acknowledge Joan Flaherty, RN, for her editorial assistance and Gustavo Díaz, MD, for taking the digital surgical photos.